At Bodhirukarama, a monastery in Kurunegala, Ven. 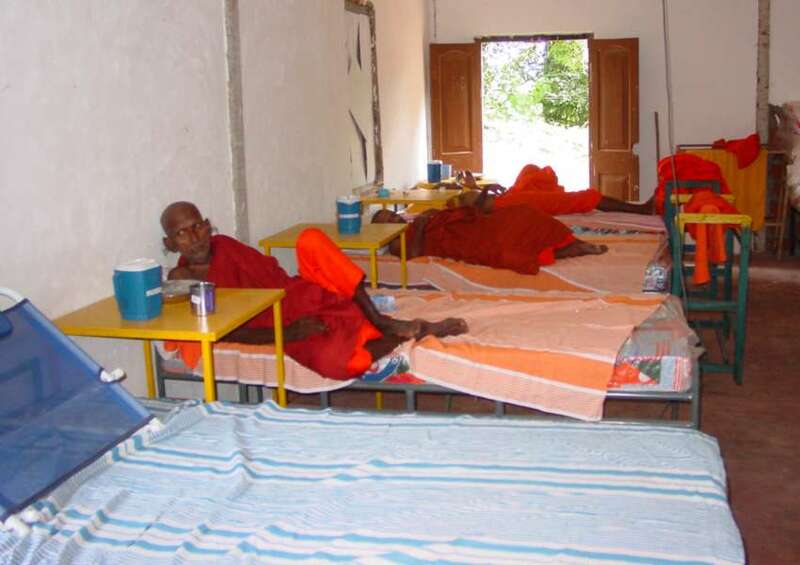 Amilasiri, the abbot, is caring for elderly monks. Here are the reports of our visits. Click each button to read the corresponding report. Appeal for water relief, -- RESOLVED! An urgent appeal for help to finish a well, March 2014 -- RESOLVED! We visited the monastery again on May 15. We were pleased to see the newly-finished tile floor and the entrance bridge. Here are some photos of that visit. He was just seven years old when he was ordained. He hails from Moderawana, a backyard village off Embilipitiya. 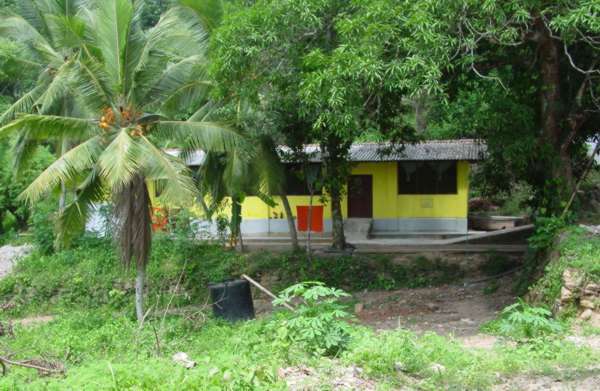 In his mid-twenties he decided to be rather adventurous and come to Wellawa, a rural area just past Polgahawela and set up a small temple. He was always keen to be of service to the community. 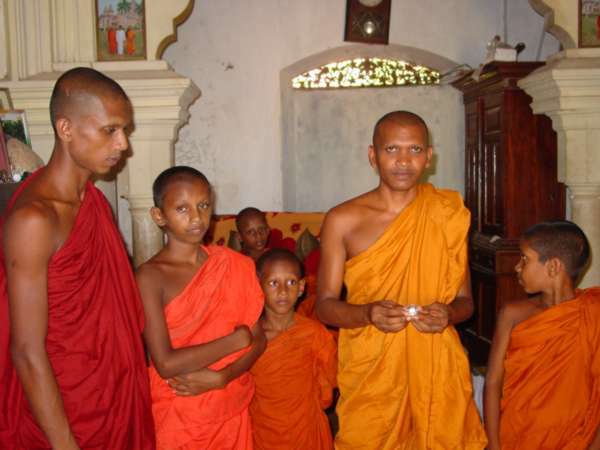 Moderawane Amilasiri Thera is now 37 years old and looks back on his 20 years in robes with great satisfaction. 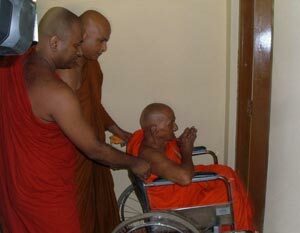 His special mission in life is caring for aged monks - most of them who find it difficult even to move. Some get about in wheelchairs. While he took care of these monks with the help of a few other young monks, he had a major problem in finding them adequate accommodation. They had to be housed in a single building with makeshift partitions. In spite of several appeals he could not find enough funds to put up a more spacious building. I asked him how these monks - most of them from faraway places - got to his temple. 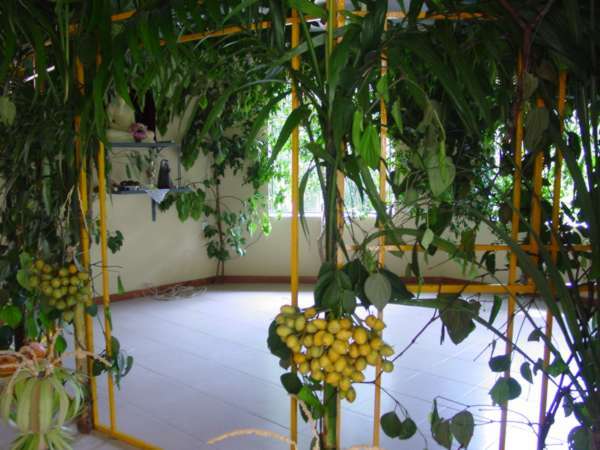 "I used to go to the Kurunegala General Hospital. Once I noticed an elderly monk who was hospitalized. He used to be there day in and day out. He didn't look very ill either. After about two weeks I asked him why he was not leaving hospital. He said that his pupil monks had left him there but had not turned up to take him back. So I brought him to the temple and started looking after him," he said. That was the start. Soon the word got round and one by one old monks found their way to the temple. Amilasiri Thera didn't send any one of them away. Though the numbers were gradually increasing, he was determined to look after them. Even giving them 'dana' was not easy. He used to go on 'pindapatha' and collect vegetables, bring them back and cook a meal in the temple with the help of other monks. Meanwhile, he was keen to see that young monks were ordained. At least ten young 'samanera' monks in their teens have donned robes under him. A visitor to the temple was impressed with the young monk's work. He realised his plight and decided to let others know of the pitiful conditions under which the aged monks were living. He sent out an e-mail to friends both here and abroad. Those who got the e-mail in turn sent it to their contacts. 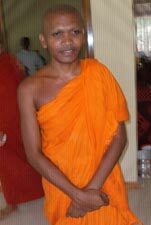 The energetic patron monk of the Dhammadeepa Foundation, Tangalle Chandakitti Thera was among the recipients of the e-mail. Always on the lookout for social service projects, he visited the temple and saw for himself the pathetic state of the conditions. Quite apart from the dilapidated 'avasaya' where the monks lived, even feeding the monks was a problem. 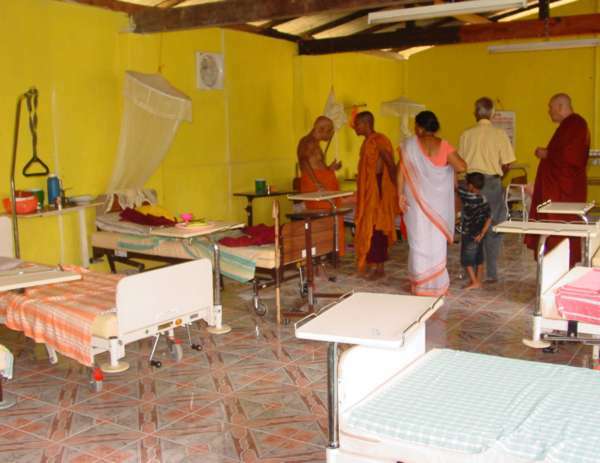 He discussed with Amilasiri Thera how they could set about the task of finding better accommodation. There was enough land but being a hilly site, much work had to be done in leveling the land. Chandakitti Thera decided to take up the challenge. "Here is an ideal project for us," he told the committee members of the Dhammadeepa Foundation, who he knew would only be too glad to cooperate. On the full moon Poya day in March, he made a presentation to the devotees who observed 'ata sil' at the Narada Centre in Sarana Road (where he resides) using the photographs in the e-mail. Here was a worthy project to undertake, he told the devotees and sought their assistance. Everyone was moved. Donations began to flow in and work was begun. The land was leveled, plans were drawn, a contractor was arranged and the building started taking shape. In just a matter of weeks the major portion of the building was complete. The roof was up. At least five rooms, an alms hall, three toilets with fittings suitable for elderly monks, facilities for bathing were ready. An electricity connection was obtained, water on tap was provided. Last week the newly built 'gilan bhikshu avasaya' (dwelling for ailing monks) was offered to the Maha Sangha. It was a simple ceremony. Several Nayake Theras of different 'nikayas' were present on the occasion. The event was also to bless Venerable Tiricunamale Ananda Anu Nayaka Thera on his 52nd birthday. He opened the building and took the first ailing monk in. The beaming faces of the aged monks once they were taken in to the newly built rooms said it all. "This is a rare pinkama," Chandakitti Thera told the gathering of devotees most of whom were the donors who helped to put up the building. "It's a combination of several meritorious deeds. A 'sanghavasa' has been built and offered. Water service has been provided. Toilet facilities have been made available. A roadway has been completed." For Amilasiri Thera it was a dream come true.